The official U.S. Light House Service structure, built in 1832 as a circular stone tower on a bluff in the vicinity of Lake Street just south of the river’s mouth, is Michigan’s second oldest lighthouse. Fort Gratiot’s earlier tower and light, built in 1825 and rebuilt in 1828, holds the legitimate claim of being first in the state. 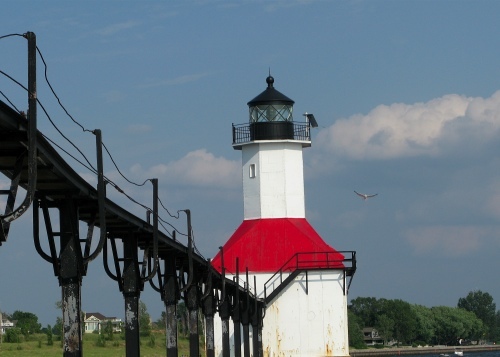 While Chicago’s first harbor lighthouse began operation earlier in 1832, St. Joseph can share the title of being the first towers established on Lake Michigan. The St. Joseph River—dredged in 1836 from a shallow three or seven feet depending on the shifting sand to a depth of a standard sixteen feet—became vital to ships delivering the area’s fruit and other farm products to Chicago, Milwaukee and other cities. Congress also voted funds to build piers on both sides of the St. Joseph River. Extending into the lake, they helped mark the channel to the harbor. The lighthouse tower on the bluff utilized whale oil lamps, eleven of them to be precise, with reflectors fourteen inches wide. By 1847, the U.S. Light House Service built the first wooden tower light at the end of the north pier. They also decided to save fuel and cut the number of lamps in the bluff lighthouse to four. Due to the need for a keeper’s quarters, a new lighthouse was built in 1859 right in front of the original tower. The two-story frame house had a square tower on the roof, similar in design to several lighthouses common to the Great Lakes region, including the Kalamazoo River lighthouse in Saugatuck. (A small replica of this design stands today close to where the steamer S.S. Keewatin is docked in Douglas.) The St. Joseph bluff lighthouse keeper and his assistant were also responsible for maintaining the pier lights. The piers and lights, in St. Joseph’s harbor and elsewhere, proved to be vulnerable in heavy fog or intense storms summer and winter. They often had to be rebuilt if ship collisions damaged or destroyed them. Catwalks allowed keepers to avoid heavy waves during storms. Winter had its own dangers. While photographs of ice-encrusted catwalks and pier lights look stunning and mystical, keepers risked their lives to cross the slippery metal walkways. They then had to chop through the thick coating on the towers, sometimes for hours in bitter weather and winds, just to accomplish routine maintenance. The U.S. Light House Service often allowed keepers’ wives to assume the station’s duties after their husbands’ deaths. St. Joseph’s first female keeper was Mrs. Jane Enos, who served from 1876 until 1881. Other women employed by the U.S. Lighthouse Service in the 1800’s included Harriet Towner (1844-1853) and Harriet Colfax (1861-1904), who both served at the Michigan City, Indiana, lighthouse. Mrs. William Monroe tended the Muskegon lighthouse between 1862 and 1871. Men and women alike were expected to fill and clean the lamps, keep the light burning from sundown to sunset, maintain the interior and exterior—including painting to battle constant weathering—be frugal with supplies, rescue any shipwreck survivors, plus keep a daily record of weather conditions, events and visitors in a logbook. Women who had often served as unpaid assistants to their husbands proved themselves as capable as male keepers. St. Joseph’s north pier light had to be rebuilt and moved each time the Light House Service extended the wooden pier. 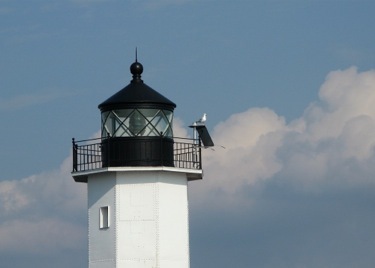 The bluff lighthouse finally received a Fresnel lens in 1886. The north pier light remained a fixed red light, and in 1896 a fog signal structure with a steam-powered whistle was built adjacent to it. A raised catwalk connected them to the shore. Two years later a second range light, a metal mast with a lens lantern placed midway on the pier, proved helpful in marking a straight line for ships steering for the harbor’s entrance. After the turn of the century, the U.S. Light House Service extended both the north and south piers again, the north by 1,300 feet. A cast iron tower, 8’3” in diameter at the base and 7’3” just below the lantern room, replaced the outer range light in 1906. A fixed Fifth Order Fresnel lens provided a strong light. In 1907, a 26 square foot steel structure, with an octagonal lantern room housing a fixed lens manufactured in England, replaced the mast and lantern system at the midway point on the north pier. The first lens manufactured in England was soon replaced by a Fourth Order Fresnel lens from Paris. In 1891, a lighthouse supply depot—built at a cost of $35,000 and two years in construction—started operations on the north side of the St. Joseph River. This included a separate keeper’s house and storage building. Located close to the piers, the depot proved ideal to load supplies on boats and lighthouse tenders. The 9th District at the turn of the century had 114 lighthouse stations. The depot also served as a repair site for lanterns and other mechanisms, plus storage of buoys and their concrete sinkers. However, a second lighthouse supply depot was constructed in Milwaukee in 1904. Since its more centralized location gave the Milwaukee depot an advantage, St. Joseph’s depot was decommissioned in 1918. The government also decommissioned the bluff lighthouse in 1924. It served as the American Red Cross local headquarters for years, but was unfortunately demolished in 1955 in favor of a parking lot. The lighthouse depot building hung on, utilized by the Navy, Army and Reserves throughout the 20th century. After being designated as a historic site in 1994, several businessmen purchased it from the government and converted it to a pub and restaurant in 1997. Perhaps due to its remote location from the downtown area, the venture failed by 2001. After sitting empty, the St. Joseph Yacht Club decided to purchase it. The lighthouse depot keeper’s house has been renovated and is now privately owned. The Coast Guard took over the U.S. Lighthouse Establishment’s duties in the late 1930’s and are still responsible for marine safety and signals. 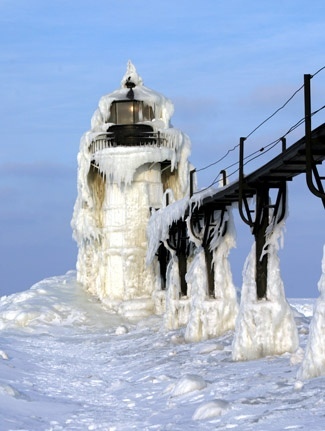 The St. Joseph range lights and catwalk, along with Grand Haven’s tower and range light, are the only two-pier light systems still in operation today in Michigan.